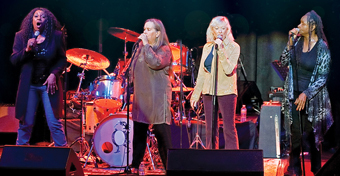 The Blues Broads – Dorothy Morrison, Tracy Nelson, Angela Strehli, and Annie Sampson – are the real deal, with deep roots in gospel and rock and roll, country and funk, and most especially the blues. Dorothy co-wrote and sang gospel's all-time bestseller, "Oh, Happy Day." She's sung with Van Morrison, Boz Scaggs, Rita Coolidge, and Simon & Garfunkel. Tracy co-founded the legendary group Mother Earth and shared the stage with Janis Joplin, Jimi Hendrix, and the Grateful Dead. Annie starred in the original San Francisco production of Hair, co-founded the popular rock group Stoneground, and has recorded with everyone from Elvin Bishop to Sammy Hagar, Taj Mahal to Elvis Costello. Angela came up in the Austin bar scene, learning from such blues greats as Muddy Waters and Otis Rush, Albert King and Albert Collins, Buddy Guy and Stevie Ray Vaughan. The point is, each of these women brings a full and rich lifetime of experience to the stage, and it shows in the depth of their performance. The Blues Broads are backed by some of some of the best musicians in the business, Gary Vogensen on guitar, Steve Ehrmann on bass, Mike Emerson on keyboards, and Paul Revelli on drums. Honorary Blues Broad Deanna Bogart has played with Joe Louis Walker, Gatemouth Brown, the Legendary Rhythm and Blues Review, and Carole King. All the broads are great on their own, and they’ll each take a turn in the spotlight, but it’s when they sing together that the whole becomes even greater than the sum of the parts. Their last show at the Freight sold out, so get your tickets early for this blues bonanza. It should be a spectacular night.